In the 90’s New Zealand made about three films of international significance. Only three films made any kind of waves internationally, and then only really at film festivals. They were good films, all made by talented directors; two of these directors (Jane Campion and Lee Tamahori) now ply their trade overseas. One, Sir Peter Jackson, chose to stay in New Zealand. He chose to build a film industry here, rather than take the easy option and move himself to one of the existing hubs. This was a gamble he made to reward those people who supported him on his early ventures. And from what we’ve heard he has always been loyal and generous to the industry – and it’s people – who have helped him build up, what is now known as ‘Wellywood’. There was never any question, that the cast and crew of The Hobbit would be more than adequately recompensed for their labour. There were never any complaints about working conditions or rates on any of his previous films. In fact, The Hobbit was going to be the first New Zealand film which paid actors residuals – something PJ has fought for. The queue of people vying to work on The Hobbit stretches the length and breadth of the country. He was worried the Australian actors would have to put on fake accents to get work. Oh dear, I do believe that is called ‘acting’! He would rather his actors get no work, than some work. I wonder if he realises that feature films are fiction. They usually aren’t based on reality. Most actors like to work. Thanks to him their reality is making coffee or surviving on a benefit. But Simon Whipp seems to think that their integrity would be at stake if they worked on a large international film. I’m starting to think Simon Whipp doesn’t actually like the film industry. He has had death threats from producers (and probably a few kiwis now, too), and has been almost single-handedly involved in destroying the Australian film industry. So why is he involved in this debate (aka the deliberate attempt by an Aussie to bring down good hard-working kiwis)? Well, it seems that the NZ based Actors Equity union joined up with Australian MEAA, headed by Mr Whipp, a few years ago. Since then, they have refused to meet with SPADA (the NZ producers guild) to re-negotiate their ‘Pink Book’ – the book of guidelines for employing actors in NZ. For 18 months now, SPADA have been trying to meet with Equity to revise the Pink Book. According to NZ law, this is the only way to negotiate terms and conditions for actors. But Equity have been lying in wait to make their point heard when the Hobbit was at it’s most vulnerable. You see, Peter Jackson is more than happy to negotiate great and awesome conditions for actors on The Hobbit. But Peter Jackson cannot make decisions for the entire industry. Because outside of Miramar, there are many relatively low-budget feature films being made, who cannot afford to pay their actors the $5000 a supporting role in Middle Earth gets. They can’t offer their cast residuals, because there probably won’t be any! And Peter Jackson knows this better than anyone. He can’t (by law) and won’t (thankfully) make decisions that effect all of us. So, Equity backed down and said they were after fair rates on The Hobbit. Well, they’re getting paid more than the SAG minimum by quite a bit, and the residuals are better than those offered in Canada and equal to what the UK offers. What’s the problem? Are they worried about how their feet might look big in their hobbit costume? No really, what is the issue here? I’m not sure Equity knows any more. They’ve backed down from the boycott. Although their unsure when they did that – last night or last week. It’s all a bit vague. But they won’t accept any responsibility for their actions. And this is where I start to get sad and outraged, because up until now I’ve been quite reasonable. The Hobbit may be forced to film off shore now. We’re talking about a US$500 million budget. That’s a hell of a lot of money. Most expensive film ever, according to some. (Although technically two films and I’m not sure that accounts for inflation, etc). So if you’re a global company who has spent two years trying to resuscitate a project into life (the whole MGM bankruptcy really didn’t help) and you’re gambling that kind of money, you’d want it to be a low-risk gamble wouldn’t you? Best option is stick with what you know. This guy, Peter, down in that little country, ‘Nu Zeeeland’ seem like a safe bet, don’t they? But wait, what’s this? Some little union is striking. Hmm, sounds scary. Let’s see if we can find somewhere safer. That’s what it comes down to. New Zealand is Middle Earth. Has been for the past decade. The safe bet for Warners, is to stick with what they know worked last time. But if that is no longer safe, then they’ll look at other options. This isn’t about them going elsewhere to increase their profit. This is about them protecting their investment. It’s a significant difference. A month ago, the offer of an extra 5% tax rebate wasn’t enough to make them look off shore. Now, with obvious unrest in the kiwi industry, it is enough. A month ago, they were rebuilding Hobbiton in Matamata. There was no talk of going overseas, no matter how much was on offer. Now, in all likelihood, without some kind of magical intervention (and I’m not just talking about Gandalf here), The Hobbit will go overseas. How can Actors Equity still face up to media interviews and be in denial about their doing? Surely they’re not that dim. Sure they don’t want to take the blame – noone ever does – but at least have the decency to hide in a hole, and at the first opportunity hand themselves over to the dark lord that is Simon Whipp. These actors have not just risked the location of filming. Personally, I think Ireland was probably alot closer to what Tolkein envisioned for Middle Earth. But what about our industry? A 3 BILLION DOLLAR per year industry! I, like almost every New Zealander, have many friends who were looking forward to working on The Hobbit. Thousands of people, who have been struggling through the past year, waiting for MGM’s problems to be fixed and Warners to give the green light, have had their celebrations cruelly cut short by this boycott. Their jobs, their livelihoods, their homes and careers are at stake here. Actors Equity represent just 400 NZ actors. Of these, maybe 60 stood a chance of getting some small parts in The Hobbit. Of these, I’d say less than half stand by their leaders actions. Many actors signed the petition saying they did not support the boycott. Many were at last night’s protest march. Very few have openly supported it. But as a whole they have contributed to what may be the loss of thousands of jobs. It’s a real shame that so few can ruin it for so many. As a friend, who works on The Hobbit, said to us last night “If it ain’t broke, don’t fix it”. I don’t think any of us ever thought the NZ film industry – more successful and flourishing now than ever before – was broke. What are they trying to fix? On the off chance that the crazy ramblings of fans out here on the ether has any actual impact on casting decisions down the road (and around the corner, across the airport and over a small hill), I thought I’d express my – and Mike’s – views on The Hobbit casting. The decision has most likely been made, but until an announcement is made and at least a third of the film is shot, I think it could still be open to influence (note Mark Wahlberg replaced Ryan Gosling just before shooting commenced on The Lovely Bones). So who should play the all-important eponymous character of The Hobbit? In my humble opinion, none other than British actor, Martin Freeman. 1. Bilbo Baggins is Very English. You could almost imagine him as a stuffy professor sitting across the pub (The Eagle and Child, in Oxford?) from Tolkien as the first little seeds of Middle Earth germinated in his mind. Martin Freeman is also Very English, having starred in some of the best and Most-English comedy and drama to come from those fair Isles in the past decade (The Office, Love Actually, Hitchhikers’ Guide). 2. Bilbo Baggins is approaching middle age. 50 or 51 according to the ever-relaible Wikipedia (and confirmed by my hazy memory). Now Hobbits don’t age quite as quickly as humans, so 50’s in a hobbit would look like 40’s in a human. Martin Freeman is a rather weathered looking 38, and could certainly pass for Hobbit middle age. 4.Martin Freeman does flustered like a Hobbit. (Skip to 4’12” if you don’t wish to be charmed and outsmarted by singing dolphins.) Replace his townhouse with a hobbit hole; Stephen Fry’s voice with Ian McKellan’s and a gaggle of bulldozers with a swarm of dwarves and you’re already watching the opening scenes to The Hobbit. Lips in the know around Wellywood are tightly sealed, but these two hints have been found on the internet, and as always may be completely unrelated, or may be quite suggestive. James McAvoy has recently dropped out of a film due to start shooting later this year due to ‘unforeseen circumstances’ or ‘personal reasons’. Could mean he has something bigger and better up his sleeve? 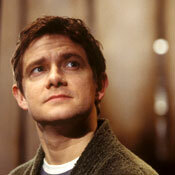 Secondly, Martin Freeman, I today found out, auditioned for Stanley Tucci’s role in The Lovely Bones. He didn’t get that of course, but old PJ knows of him, knows about him and possibly, hopefully likes him. Fingers crossed! That’s my two cents worth. Feel free to comment, or make suggestions (which will be duly ignored).